Battery, Volts, Amps, Fuses, Cables, etc. Return to: of Battery, Volts, Amps, Cables, Etc. Many of the control signals on the LX200 are carried by telephone type connectors known as modular plugs/sockets. These are usually 4, 6 or 8 pin plugs/sockets. These signal cables can be extended to at least 100 feet and often much longer. I have tested cable lengths up to 150 feet for the following cables. All 232 Serial cables including the computer to LX200 cable, the serial cables to the various imagers and the keypad cable. Some of these cables are available in complete form from Radio Shack or Newark Electronic supply houses. Cables over 25 feet in length will have to be custom made since none are generally available. A standard handset coiled cord will work for the keypad. This is a four wire cable with 4 pin Modular plugs at each end. So called modular jack extension wires have a 6 pin modular connector at each end but are generally only a 4 wire cable. These will work for any of the purely serial communications ports but will not carry ground and power signals since these signals are on pins 1 and 6 which are not connected. Custom cables can be made to any length by purchasing bulk 4 or 6 wire flat modular telephone cable and attaching plugs to each end. The cable and plugs are available from Newark electronic supply or possibly other suppliers that stock telephone supplies. In order to attach the connectors, a special crimping tool is needed. There is a Telco tool that will crimp both 4 and 6 pin connectors which should be considered. It is plastic and thus for light duty use. But it is only $18. With the proper crimping tool the connectors are very easy to apply. Without, it is all but impossible. It is possible to put the connectors onto the wire in two orientations. A right and a wrong way. You must get this correct. When the cable is a standard cable, the color coded wires will go from left to right at one connector and in the opposite direction on the other when the connectors are looked at side by side pointing in the same direction. Viewed another way, the connectors and wires go straight through with no twists when laid out straight. NOTE: the cable that goes from the imager to the CCD socket on the LX200 IS NOT a standard cable. DO NOT substitute for the coiled cable supplied. A special cable of greater length can be made but do not attempt this unless you are sure of what you are doing. If a new cable is made, the connections must be EXACTLY like the coiled cord cable supplied for the purpose. This requires a cable with a twist and one pin removed at each end. The modular plugs/sockets are made to carry low currents and like all plugs should be worked from time to time to keep down oxidation on the contacts. Regular use, plugging and unplugging, should not cause problems and will generally be good for the connectors. Signal circuits are often called "dry" circuits because they carry little current. Even slightly oxidized contacts can cause problems in "dry" circuits. Thus, if these plugs are seldom used they should be worked from time to time to keep them clean. Standard contact or switch cleaner can be used but excess should be wiped away. Recently there have been complaints about declination drive intermittent electrical problems. Many do not realize that there is a second plug on the inside of the fork where the declination cable plugs in. This plug should also be worked from time to time as well and cleaned. The declination cable carries motor power, ground and DC supply power as well as the two signals from the encoder of the motor shaft. Interruption of any of these signals will cause a dead or runaway declination drive depending upon the type of fault. The connector that attaches to the scope is Radio Shack size N, 5.5mm OD, 2.5mm ID. Size L is 5mm OD, 2.5 ID, so it's close enough that you'd probably get a connection, but it will be more reliable with size N.
This note is a short treatise on plugs on the LX200 and pin numbering conventions. There has been some confusion about pin numbering on the plugs on the LX200. This is because Meade manuals seem to differ from standards used by others. I hope to clarify this situation in the following. My convention and what I think is generally used by the electronics industry is as follows. Take the example of a 6 pin RJ connector. From the front of the socket (which is female) and with the keyway at the bottom there are 6 pins at the top which I designate from the left to the right as 1, 2, 3, 4, 5, 6. When the socket is drawn on a flat sheet as in a schematic circuit diagram, this connector is normally drawn as though it has been flattened. Thus the pins will be show next to each other in a single line and labeled in the order 1 through 6. This seems to me to make perfect sense and is the convention I use. Now when viewed from the back of the socket with the keyway still at the bottom, the picture becomes less clear. From the back side there are two rows of wires coming out of the socket. There is a top row and a bottom row of 3 wires each. The top row is offset to the left from the bottom row by a half space. The wires are colored, but to use colors is folly since different manufactures use different colors. But, using the above convention, the bottom row from right to left becomes 1, 3, 5 and the top row becomes 2, 4, 6. This is of little consequence to the user since the user sees the front of the socket. The circuit board manufacturer sees the back side and gets it wired correctly. So in summary, I have taken the viewpoint of the user and numbered the pins in the order that you see them from the front of the socket with the keyway down. I have wondered why the Meade manual shows the pins in line and gives them the numbering from right to left 1, 4, 2, 5, 3, 6. That is from the front with the keyway at the bottom. Their chart shows the correct function of the pin to go with their numbers. But why the strange numbering? Apparently they have numbered them from the back as follows. From right to left the numbers are for the bottom row of 3 wires 1, 2, 3 and for the top row of wires 4, 5, 6. This would make the pin numbers from the front 1, 4, 2, 5, 3, 6. From the viewpoint of the circuit board maker this convention is sensible since it corresponds to that used for other two row straight connectors. So it is one choice of conventions that is correct. Most two row straight connectors are drawn on circuit diagrams just like IC pignuts. But sometimes from the top and sometimes from the bottom of the board. (one needs to be careful here) However, the RJ connectors, like edge connectors, are usually shown as one straight line of pins on a schematic. But I find it strange when viewing the socket from the front. In any case, I think it wise, from the users viewpoint, to label the pins with the actual function rather than with pin numbers. Thus I will try, in the future, to do this. Never use colors of the wires since for both the sockets and the flat cables have no established convention for these colors or their order. With this convention, the pins from left to right with the keyway at the bottom will be called: For the CCD socket: NC, Ground, West, South, North, East. And, for the RS-232 socket: +12 (18) volts DC, Ground, Aux. serial out, PC receive data, PC transmit data, Aux. serial in. For the RS-232 cable this is the correct convention for using a normal RS-232 PC cable and a normal D to RJ adapter. With this convention, there is no confusion about pins numbers but rather a clarity of what function each pin carries. I am currently working on new circuit diagrams for the LX200 scope and am trying to get everything right. This is a big job. The current diagrams on my web site are not perfect but are a good start. More later. Meade has improved the motor circuits on the main board of the LX200. "New LX200 main boards now include overload resistors that prevent motor burn out" is the quote from their Main Board Installation Addendum. For those interested, R-4 and R-9 on the main board have been replaced with 10 watt 8 ohm ceramic resistors. These new resistors are mounted on the side of the base with a metal clip and double sided tape. They are then wired back to the main board to the holes previously occupied by the smaller resistors. The mounting point in the base is the rectangular gap on the right side (looking from the bottom, face plate down) forward of the main board. Heat transfer goo is also put on the resistors where they contact the side of the base. Basically, you want to put enough of the DC4 into the connector so it will displace *all* the air when you mate it with the other connector. If you plan to leave it set up for anything longer than a week or two, or if it might rain, consider the additional steps I use. Wrap the entire connector junction area with electrical tape, starting out on the cable on one side and proceeding to the cable on the other side. Don't be stingy with the tape; use about 50% overlap. Then cover the wrapped joint with a good layer of synthetic silicone sealant (clear sealant will make it easier to find the tape end later for unwrapping!). Let it cure and you're in business. I've undone connections like this using "UHF" (PL-259 type) connectors after over five years, and they came out looking like new! (Anyone who has ever seen these screwball connectors in their normal oxidized state after a year or two open to the weather *knows* how bad they can be. I do know from personal experience that this little trick works quite well. Another item that works well on connectors is Stabilant 22A (my little 15 ml container says). It's actually a contact enhancer, and the local 2-way radio folks use it on microphone, speaker, antenna, etc. connectors for high reliability. Made by D.W. Electrochemicals Ltd./Ltee., 97 Newkirk Road North, Richmond Hill, Ontario, L4C 3G4, CANADA. These guys locally swear by it, but I don't know if they use that on *permanent, outdoor* connectors, or if they add an additional wrap & silicone sealant, etc. I generally use Caig Laboratories (San Diego, California),"DeOxit" spray on various indoor connectors, switches, etc. It's also a contact cleaner/lubricant that works *very* well. > I can't find the wiring diagram for the PC serial port to LX200 serial port. First remember that this thing is an RJ25C (6P6C) connector and NOT an RJ11 (4P4C) connector. So you may have trouble finding the right part. Fry's electronics does have DB9 to RJ25C connectors, or you can buy an RJ25C and wire it up with a crimp-tool and a soldering iron. As you can see it is only a 3 wire serial communication. The RJ25C has the following layout (shown with the clip away from you). In case you are wondering the numbering is consecutive, from the left, skipping every other pin, then starting again from the left, again skipping every other pin. Check at <www.cyberguys.com/> (use the keywords USB SERIAL in their search engine on the site), or call 1-800-892-1010. I got a new IBM notebook and found it had no serial ports and I use the notebook at work to interface with onboard automotive computers and ALL the scanner software works with the serial ports! The company that makes the scanners tried a bunch of these type adapters and this was the only one that functioned in all situations with all the available software. I use it with SkyMap Pro and my LX50, it works perfectly. > I have a single cable like this, and it does work very well. > still puzzled how folks do it now - even older laptops only had 1 serial port. I can't promise it works in all situations and with all adapters. The stuff I'm doing runs under windows - if you have software that cheats and talks to the hardware directly it would be a problem. I had one piece of software that arbitrarily limited the max com to 4, but the vendor fixed that for me the same day that I called. My adapters are Keyspans. I'm not even using the "official" serial port version, I'm using the "PDA adapter" because it was cheaper. I've used them on Macs and PeeCees. Not the best thing I ever saw, but adequate. Keep in mind that most, if not all of these adapters are for Win98 and above. They will not work for Win95, or none I have found thus far. I was finally able to get the device to work properly by changing the port default settings in control panel. I had to change the com rate to 57600 and flow settings to "hardware". For whatever reason, this now lets the multi port hub work perfectly. Go figure. The one I have is made by Socket Communications, Inc., 510-744-2700, it is a one port Serial I/O card P/N SL0700-004. They also make one with two ports, if you need to add that many more. It includes the plug in adapter cable that mates with the standard Serial plug...I would sell you mine, but I may need it again. It's called a Socket I/O PMCIA card, outputs to a serial cable that becomes a second serial port on your laptop. Of course you have to have an open PMCIA port to plug it in...comes with the drivers and everything. One serial port for the autoguider, one parallel port for the CCD, and another serial port for the LXD650 telescope control in Megastar. I'm pretty sure that the color coding is standard but double check your wiring. Note that the LX200 Female RJ45 port has the color order reversed from the Male splitter adapter so don't get mixed up. Also make sure that Pin 1 from the LX200 (+12V DC) is disconnected from everything by clipping and sealing the Blu wire coming from the RJ45 Male splitter side. Double test the connection all the way to each DB9 pin side to make sure everything is wired correctly before connecting the LX200 to computer or you may blow your serial chip! Note: should open new browser window over this one. Cover each of the 3 remaining colored wire connectors with electrical tape and shove them down into the plastic connector body. Make sure everything is turned off! Plug the fully assembled connector into the back of your computer. Plug the 6P6C twisted pair patch cord into the back of the fully assembled connector. Plug the other end of the 6P6C cord into the RS232 port on the front panel of your LX200. You are done! !The fully assembled cord cost you $6.88 + tax to purchase and no longer 20 minutes to assemble. Congratulations!! These instruction worked for me to produce a fully functional serial cable to control my LX200. Proceed at your own risk. I do not guarantee this will work for you and will not be held responsible for the affect of these parts, instructions or the finished cable on your equipment. Make sure your computer has the male part serial connector (I've never seen a female here). Cut off one RJ12 and strip jacket back 1/2 inch. Strip 1/8 inch off the green, yellow and black wires. Ignore the rest. Solder the green wire to pin 2. Solder the yellow wire to pin 3. Solder the black wire to pin 5. Attach the hood to the D-Sub and you're in business. You can save money by 1) buying a shorter cable, or 2) a cheaper hood. These parts are also available from radioshack.com. Prices are lower and you might not pay tax but you pay a couple of bucks for shipping. This version of a serial cable is neat, clean, requires no soldier and can be assembled in under a minute. This is one of those adapters where you simply click the wires into the holes you need them in for your particular project. There is an RJ-11 connection on the adapter so the cable remains intact, plus this gives you an option of having a shorter or longer cable as the situation changes. Push the pins in until you feel or hear them seat. Then snap the head on the shell and you're done. It is called on the tester an "RS232 Mini-Tester". On the package it is called "RS232 Line Analyzer, the Radio Shack number is 276-1401. It has 25 pin D connectors on each end so you will have to get RJ to 25 pin adapters. These are also standard. Note that you will need two 25D or RJ adapters. One with a male D25 and one with a female D25. The checker has two D connectors. A male and a female. John, pins 5, 2, and 3 are the correct ones for the D9. If you can't get the primary port to work, it is worth trying the secondary port wiring before shipping the scope off. The ports are susceptible to damage from nearby lightning while there is a cable plugged in. If you have never used the RS232, lightning damage is unlikely. The common failure of the RS232 port is the MAX-232 chip on the main board. It is not socketed, but can be replaced and is commonly available. I installed sockets for that chip on the ones I have serviced, as they are a known failure point and not fun to unsolder even with the correct tools. >that we might try to repair? I blew my primary RS232 (lightning or hot plugging) and have been using the secondary one for several years. Here is a description of a LX200 Classic scope mod. I did several years ago. I wired the aux. plug-in on the control panel of my LX200 to power my palm-sized VCR. I did a resistance check on the connectors to find 2 that didn't connect to anything. I then hard-wired them to the 18 volt telescope power connector on the control panel. I arbitrarily chose one wire for positive (+), the other for negative (-). It is very important to note that I wired to the terminals of the power connector. So, the power for the aux. plug-in is before the control panel fuse so the fuse won't blow and the panel is safe! I have an external positive 9.6 volt regulator and fuse in a box. I plug one cord into the aux. panel for power, and the other cord into the camera. With this arrangement I don't have the excess weight of a battery pack on an already burdened system, and I have unlimited power to take my time with the setup. Subject: Power Panel/Cable Problem Solved! I reported having lots of trouble with the plug/connector combination on the power panel, and have spent a considerable amount of time trying to discover why the power goes off when I wiggle the power cord near the plug or the plug itself. I tried just about everything. One of my astro buddies came over with at alternate DC power supply and cable just in case it might solve the problem. It took about 1 minute to discover the problem. If you look at the way the wires are connected to the plug, my whole plug rotates while the wires are fixed in position. That is, the finger like piece of metal to which one of the wires is attached is free to turn around as one turns the black sleeve of the plug. This results in the freely turning metal finger as providing the contact with the metal on the plug, and not very well. I'm sure it needs to be soldered to the metal on the plug. Earlier I had noticed that this might be the problem, but had no information on whether it was correctly attached. When we saw his power plug and compared it to mine, it seemed we might be on the right track. I've been operating for over an hour with my power supply and his cable without any power outages. I have compiled the circuits for the Classic LX200 telescope into three parts which can be easily downloaded. These are not official circuits but might be of interest to some users. Thanks to Mr. B. S. Jones for providing the circuits. They are at my website. Note: should open new browser window over this one. > incorrect. Therefore you need to cut it in the middle and cross connect. > three wires, Ground, Send (TX) and Receive (RX). > The serial to USB sounds problematic and I would avoid this path. Kevin, the iMac's are a whole different animal than the older Mac's with the serial DIN8 connection. The RJ11 jack on the iMac is a 56k internal modem (i.e. it is talking in analog modulation not digital), and so is not a RS232 port. USB to serial is the only option, and should work fine. I just set up 61 iMacs as student computers where I work, so I know them pretty well. I have used the above instructions to make a cable, and it works great. I have never tried to connect my LX200 using the USB to serial converter so I can't verify first hand if this will work. I can tell you that theoretically it should, as the converter is designed to work with all the older Mac printers and modems which are RS232 devices. A lot of discussion recently around the sturdiness of the power connectors got me thinking about another approach to speeding up setup and I just installed a 6 conductor standard trailer hitch wiring harness to carry power to the scope and all its accessories (which are mounted either on the scope or tripod and transported on a modified 'Stewart Sled'--see AstroDesigns via the Home button). The beefy connector provides for a single step hook up and eliminates the concern around the normal Meade connectors loosening -- they stay in place all the time now. I've placed a couple of pictures on my web site. Click on the 'Cable Management / Power Connections' link on the updates section of the Welcome page. >rattling around in the base. Maybe I should just duct tape them to the inside. The resistors fit into the wings of the W shaped bracket and then the double sided tape adheres the now-bracketed resistor assembly to the inside wall of the aluminum base casting. There may or may not be some silicon heat transfer grease (don't remember from when I did mine) included to help transfer heat from these new drive current limiting resistors to the casting wall. >instructions that Meade sent me when I had to replace the PCB to my scope. >If you can find a good thermal adhesive somewhere I would use it. Mike -- Whoa! The white stuff from Mead is actually a "heat conducting" silicone grease(paste). Yes it won't stick.......It's to be smeared like butter just on the face of the resistors, carefully, so you don't get it an the center bar of the heat sink where the double sided sticky tape goes. Then (after applying the double sided sticky tape to the center bar of the heat sink), peel off the second side of protective film on the sticky tape and without getting the white stuff on the sticky tape, carefully and with significant pressure, stick the assembly to the sidewall of the base compartment. Test it by tugging on the leads a little bit to make sure it is nicely stuck to the base. I was tweaking my 8" LX200 Classic and decided to measure the output of the AC power supply. Instead of 18V under a moderate load (300 mA), I saw about 22V. Even with a 2 amp load, it was 20V instead of 18V. I attribute this to the high line voltage at my house (believe it or not, anything up to 130VAC is within spec, and ours is right at the 130V mark; we use light bulbs like there's no tomorrow). 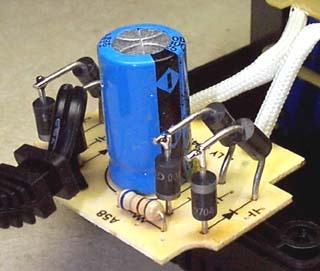 Anyway, the Meade power supply is completely unregulated - just a transformer, a diode bridge, and a 6800uF capacitor. So naturally the output voltage is going to be high. I decided that 20-22V was too high, so I dropped it by adding four diodes inside the power supply. (I've seen the Topical Archive article on adding several in series with the output, but I wanted to keep things clean.) After adding the diodes the output voltage ranged from 17V under full load to 18.5V under minimal load. There are effectively two diodes in series, producing a drop of about 1.4V total (in a bridge rectifier circuit, only two of the four diodes conduct at any time). For each of the four diodes, I unsoldered one end and bent the diode up. I then soldered a second diode in the PC board hold, being careful to keep the same polarity as the original. Finally, I soldered the other end of the new diode to the end of the original diode. I used 1N5400 diodes, rated at 3 amps.